An exceptional mid layer with competent outer layer properties. 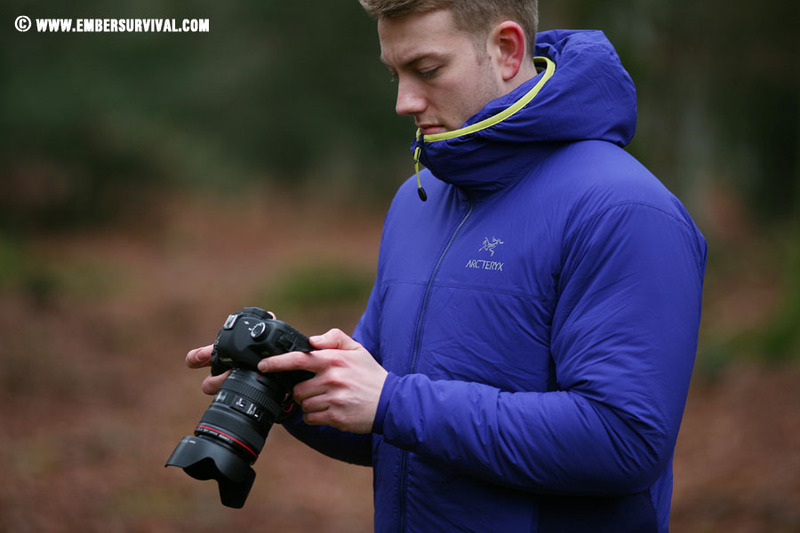 The Arc’teryx Atom LT Hoody will feature in our full review. Let’s check it out. I am not a huge fan of relying on fleece for warmth. Firstly they are heavy, not very breathable and above all hard to pack when not in use. But out in the field you still need to stay warm when the temperature drops. The Arc’teryx Atom LT Hoody is a high-end synthetic insulation piece from Arcteryx. It has completely replaced fleece in my layering system and is my go to choice for staying warm in reasonably cold conditions (about up to -10 when active and moving). An insulation layer works by trapping warmth radiated by your body and storing it in fibres that contain a lot of air. You have a choice of what types of fill are used. It could be natural down, synthetic down or a reflective aluminium. All have upsides and downsides. The mark of a good garment is that you are unaware wearing it and moving through changing landscapes and seasons you want a layer that also can adapt and be flexible to your needs. A small pack size is vital as is high levels of warmth. Likewise great freedom of movement is also a welcome feature. The Arc’teryx Atom LT Hoody would have to score highly in all these to be considered a good garment. Starting with the cuffs, the Arc’teryx Atom LT Hoody has elasticated material around them to block out the wind from coming up your arms. Consequently it makes putting layers on top easier as the arms don’t roll up when you put a jacket on top of the Atom LT. The hood is very roomy but has no peak or adjustment options. 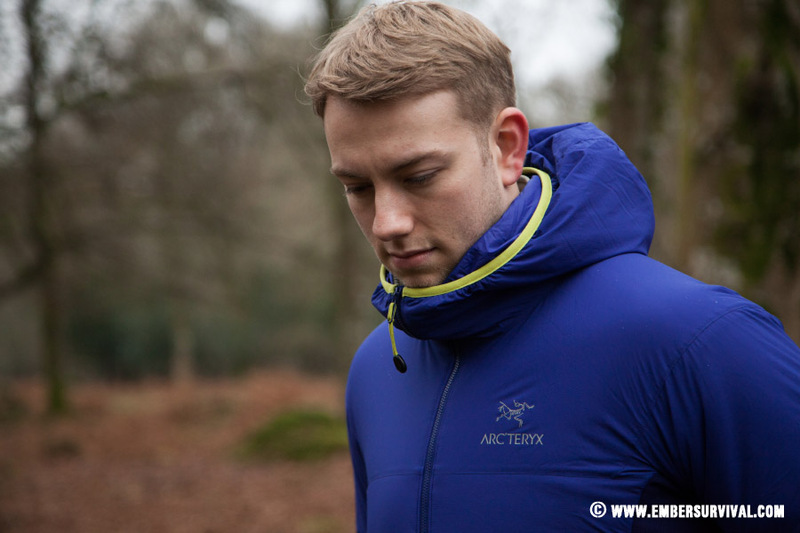 In some newer versions of the Arcteryx Atom LT Hoody a drawcord at the back has been added. The face fabric is both wind and water resistant with a DWR. This you can reproof yourself when necessary. These features are important for when you are briefly popping outside your shelter or out and about in slightly bad weather as the Atom LT Hoody can be used an outer layer too. Having the face fabric repel water certainly comes in handy in numerous situations. The insulation technology is Coreloft, which is a synthetic fill. Whereas Primaloft is a homogeneous fibre Coreloft has a combination of small and thick fibres. They claim helps loft the jacket when you bring it out of compression. The fill is also incredibly warm for its weight, I have been down to -10 in the Atom LT Hoody and it copes exactly how I wanted it to. 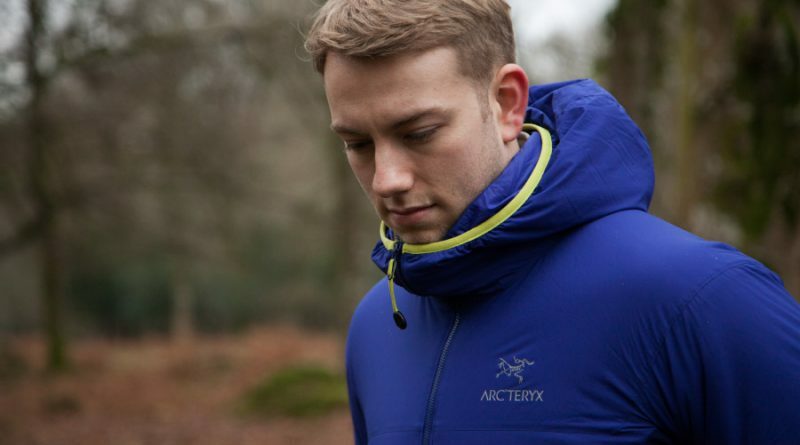 The Arc’teryx Atom Lt Hoody works so well at keeping you warm but not sweaty, its a pleasure to wear. A major factor to achieving this is the side panels made of Polartec fleece, which delivers warmth, flexibility and wind resistance. However by having a slightly less warming material under the arms make a lot of sense as it’s normally an area that overheats a lot. The lack of Corelift fill under the arms makes a big difference in this jacket compared to my other synthetic pieces which have the fill covering the entire upper body. The under arms are gusseted to prevent the whole piece lifting up when you raise your arms. This is super important for an insulation piece as you do not want cold air rushing in every time you move around. Attention to detail is what sets items apart and the laminated hem on the Arc’teryx Atom LT Hoody is one small feature that impressed me . This is an area of high abrasion and stitching here can come undone. In contrast lamination stands up much better to regular use. Hiking along a frosty and snow covered Dartmoor is hard work, but stop and rest for a moment or pause to set up a camera shot and you are soon shivering. The Arc’teryx Atom LT Hoody packs down so small and is so light that it is always on my packing list for backcountry trips. Take it out and a simple agitated shake is all that is needed to loft the jacket. Once on, warmth soon returns with the instant hit of pleasure from the wind chill being removed too. The Atom LT Hoody is one simply subtle piece offering warmth, a small and lightweight pack size. It has many technical features beneath the surface that all come together to produce an item that works so well. As a mid-layer it’s perfect and for the UK climate and I think it works so well here. The face fabric is very lightweight and if you are wanting to use an Atom LT Hoody for more of an outer layer you should probably look at the Atom SV. Having a synthetic fill you can get it damp and it will still keep you warm whereas natural down tends to clump together when it gets wet. The result of this is ever diminishing warmth.